Three county commissioners from Missoula and first three county commissioners from Sanders County. Pictured are Beemish and W. A. Beebe, who donated the ground for the Heron cemetery and land to the Catholics for a church at Heron. Courtesy Georgia Knott MacSpadden collection. The Montana Legislature took action February 7, 1906 creating Sanders County from the western portion of Missoula county. Commissioners named were W. R. Beamish, W. A. Beebe and C. W. Rittenour, who was elected chairman of the board. The big political fight that followed was over the location of a new county seat. Plains moved a newspaper and the equipment for printing it to Heron. Known as 'The Heron Examiner', its main purpose was to influence the selection of the county seat and officers. It was advocating Plains. Strong alliances as well as bitter enmities formed quickly. Determined men were undaunted by scruples to achieve their goals and gain power. Residents of Heron, Noxon, Tuscor, Trout Creek, White Pine, and all the other communities located on the western lands of the proposed area, were intensely interested. People were willing to commit themselves in whatever way that presented itself to get the seat of government located where it benefited their own particular interest best. "The two outstanding men concerned in the creation of Sanders County were J. A. McGowan, a merchant of Plains, Montana, and Edward Donlan, a lumberman of Thompson Falls. The citizens, represented by McGowan, Donlan, and various favor seeking and civic-minded persons, held a secret conclave the results of which were never clearly explained. It was agreed, however, that one of the leaders was to name the officers of the new county and the other should name his town as county seat. "People affected by the creation of a new county talked of nothing else. Both towns were pulling all unseen wires to gain seats in the new county offices and to gain a permanent hold on the county seat. Citizens of Plains and Thompson Falls, upon any chance meeting, engaged in bitter arguments and impromptu fist fights at the slightest pretext."*1. The battle that had raged for months over the location of e county seat ended when Thompson Falls was chosen. The board adjourned to meet March 5 at 10 a.m. in Thompson Falls. Gust Moser was the new county clerk. On March 5th resignations were read from W. R. Stephens, county clerk and recorder and G.L. Vanderpool, treasurer. Motion was made to accept them. Attorney General Albert Galen advised that W. C. Shultz, County Attorney and Miss Beulah Wheeler, the County Superintendent, were ineligible because of lack of residency requirements at the time of their appointment. The Board declared the offices vacant. They then made the following appointments: W. C. Shultz, County Attorney; Gust Moser, Clerk and Recorder; Hugh R. Stephens, County Treasurer; I. R. Blaisdell, County Surveyor and Miss Beulah Wheeler, County Superintendent of Schools. Beebe voted 'no'. The other Commissioners voted 'yes'. The county then paid $8,555.88 to the Missoulian Publishing Company for blanks and books for the county offices. Three townships were created: Smead, Jocko and Thompson.1. The next day the County Commissioners met at Missoula. Sanders County assessment was arrived at to be $2,590,370; true assembled value of all property in Missoula County $12,305,784. It was reduced to $1,715,477. Actual gross indebtedness of the two counties was $254,270.01. $40,962.06 Sanders County indebtedness to be paid to Missoula County leaving $203,270.4l as Missoula's share of indebtedness. 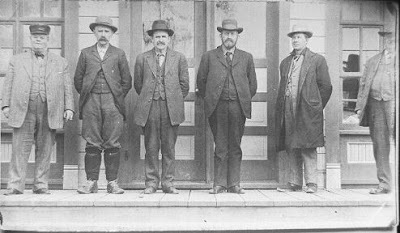 The commissioners met again in Thompson Falls March 12. They leased the building owned by C. W. Doenges for one year as the courthouse at $100 a month. C. W. Willis, Plains, was appointed to the Board of Directors of the Montana State Fair. The next day they met to create school districts, appoint justices of the peace and create road districts, since these were the most pressing problems of the newly created county. School Districts became: Plains No. 1; Thompson No. 2; Heron No. 3; Valley No. 4; Lynch No. 5; Trout Creek No. 6; Ess or Swamp Creek No. 7; Paradise No. 8 and Dixon (called Arlee) No. 9. S. J. Higgins was appointed Justice of the Peace for Smead Township. Road districts and supervisors were set up: District 7, all Territory from Trout Creek (stream) to Noxon, Beu Pestridge; Trout Creek; District 8, all territory from Noxon to Smeads including Bull River, no supervisor named; District 9, all territory from Smeads to Idaho state line, R. A. Chapel, Heron. The commissioners leased the basement of the International Order of Odd Fellows (IOOF) Hall for nine months as a jail, paying $10 a month for it. Before long Ed Hampton, Noxon, was District 8 Road Supervisor. Quoted from a compilation of histories of western Montana manuscripts by Evelyn M. Davis, Ruth Harlow, Russell R. Ross and others.